Acute urticaria is the type of urticaria of which flares last 6 weeks at most. It is associated to the presence of highly itchy hives (red swollen lesions) of different sizes on any site of the body. 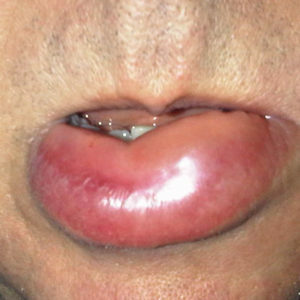 Angioedema (swelling) may also occur, particularly on the face. Symptoms can range from mild to severe, and can be serious. In more serious cases, the tongue and glottis may get swollen, which may be life-threatening if the individual does not receive prompt medical attention. attention. The most common causes of acute urticaria are drugs, food, insect bites, infections (especially viral infections) and direct contact (latex). It may be triggered by allergic and non-allergic mechanisms. ALLERGIC acute urticaria: There is a rapid onset of symptoms, within up to one hour after ingestion of the causative agent. This is typically a serious picture, usually accompanied by angioedema. The most frequent causative agents are food and drugs. Foods most frequently implicated in urticaria are crustaceans (shrimp), peanuts, wheat, soy, eggs, and milk. Individuals allergic to those foods may also present intolerance to similar or related foods, such as, for example, a person having a peanut allergy may develop the condition by eating walnuts or almonds. 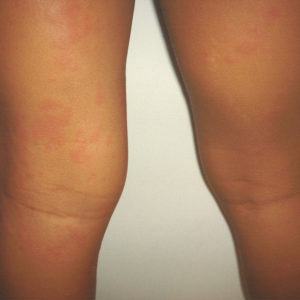 The drugs most frequently implicated in this type of allergic acute urticaria are penicillin and its derivatives. NON-ALLERGIC acute urticaria (also called pseudo allergic or false allergy) occur as a result of intolerance (and not allergy) to drugs (especially anti-inflammatory agents) and to the artificial color tartrazine yellow (veja o que devo evitar). This kind of urticaria is dose-dependent, i.e., it only occurs if the substance ingested amount is enough to trigger a flare, but this may vary among individuals, and does not always happen.